But this ghoulish holiday isn’t just a night of tricks or treats. There are service members standing watch around the globe. Some at sea, others in fighting holes, and some jumping out of airplanes, while thousands of miles away their wives and children carved pumpkins alone. 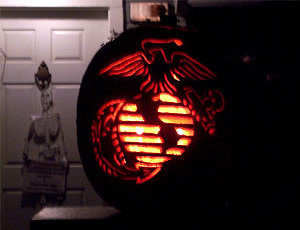 And what exactly did Marines for Halloweens past, and even up to present? In 1799, Marines did their trick-or-treating in Guahani, Haiti, in action between the U.S. brig Norfolk and a Picaroon barge. The active duty strength of the Corps was roughly 400 warriors, enlisted and officers. By 1833, with the forces’ population more than doubled, Marines and seamen from Commodore Woosley’s squadron landed at Buenos Aires, Argentina, to protect American lives and property. On Halloween, 1916, during a conflict in the Dominican Republic, Marines were advancing on enemy strongholds. Later in the year, Marines would arrive in Port-au-Prince, Haiti to protect American citizens in the Caribbean. The U.S. would go on to proclaim the military occupation of the Dominican Republic. Marines would further continue to Cuba to protect American interests during a revolutionary period in early 1917. In late October 1926, then President Calvin Coolidge approved the use of 2,500 Marines to guard the U.S. Post Offices. On Halloween of the same year, a detachment of Marines from the USS Rochester landed at Bluefields, Nicaragua, to support the Banana Wars. Warfighting excellence on “All Hallows Eve” continued during the Pacific Island Hopping Campaign of WWII. In 1942, Marine bomber squadrons arrived at Guadalcanal to provide close air support against the Japanese. During the Korean War, Marine Tactical Air Control Squadron 2 realigned to augment the 1st Marine Division. Combat operations would continue across the war torn country for nearly two more years as forces battled the communist Chinese. By Halloween, 1954, the strength of the Marine Corps was 221,352 men. The Vietnam conflict, nearly peaking in escalation in 1968, is also a prominent element of the Marines’ history. In October, 1968, operation MAMELUKE THRUST, conducted by elements of 1st Marine Division, ended 25 miles southwest of Da Nang. The overall operation accounted for 2,730 enemy kills. Oct. 29, 1982, Marines were rotating units in and out of Beirut, Lebanon, as part of a multi-national peacekeeping force. Two CH-46 Sea Knight helicopters collided while conducting routine training operations in Okinawa, Japan, on Halloween of 1988. In a secret decision to double the number of U.S. troops in Kuwait, President George H. Bush rapidly escalated the occupation of the Persian Gulf Oct. 31, 1990, leading to the Gulf War of 1991. The decision was made public Nov. 8. And in early October 2001, members of the 15th Marine Expeditionary Unit secured Kandahar Airport, Afghanistan, beginning Operation Enduring Freedom. Marines have continued to battle enemy forces throughout the world over a long and illustrious past. No matter what the season, Marines are on the job.